First of all the gel extracted from Aloe Vera leaf can be used to treat wounds, burns and other skin problems. We only need to apply a layer of aloe vera gel over the problematic area, then it can heal this area and reduce the risk of infection, because of its content of aloectin B. It can stimulate our immune system. It is an easy process to extract this gel from Aloe Vera leaves: just cut in half and the inner pulp rubbed over the affected area of skin. It can quickly soothe the burnt area etc. Secondly the yellow sap from the base of the leaf is called bitter aloes. It contains anthraquinones which are a useful digestive stimulant, what is more, it is also a strong laxative. Extracts of the plant have antibacterial activity. Apart from its external use on the skin, aloe vera can also be used to treat chronic constipation, poor appetite, and digestive problems. However, it is not a panacea, beacuse we should not apply this to pregnant women or people with haemorrhoids. It also has a history of treatment of cancer. There are many different ways to consume aloe vera. Japanese people commonly add aloe vera into yogurt, and also have drinks which have aloe vera as ingredients. On the other hand Pakistanian traditionally mix dried gel of aloe vera with other herbs, and eat such mixture after their meal to help them digest food; whereas in Mexico, people usually add aloe vera to their smoothies. In China, Aloe Vera has even been used for making aloe vera wine, aloe vera capsules. 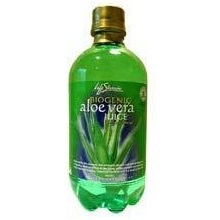 In cosmetic industries aloe vera are used to make shampoos and handcream etc etc.